The Latin American Travel Association (LATA) has revealed the winners of the LATA Achievement Awards for 2018. They were announced on 11 June during the B2B travel conference Experience Latin America (ELA). Now in its 8th edition, the LATA Achievement Awards recognises individuals and/or companies who have made an exceptional contribution to the development of travel to Latin America. Australis was awarded for providing an unforgettable cruise experience that includes travelling to some of the most remote regions of the world such as Cape Horn. The tours have resulted in outstanding customer satisfaction rates. Aqua Expedition was recognised for combining high-quality accommodation with immersive Amazon experiences such as their recently launched 2018 hosted departures. Belmond was awarded for launching the first-ever luxury sleeper train in Latin America: the Belmond Andean Explorer. The trip takes guests to over 4,000 metres above sea level and travels through areas of the Andes that are not usually accessible to tourists, whilst offering in the epitome of luxury. Maya Trails was recognised for identifying the glamping market as one that has potential growth in Latin America, and for developing a tour called the ‘Mayan Community Glamping Trek’ that combines trekking in Guatemala with overnight stays in luxurious accommodation. Air Europa was awarded for its continent-wide support and for the introduction of the new 22 Dreamliner aircraft, demonstrating that the airline is investing heavily into its long-haul business, with the benefit of reduced fuel usage, fewer emissions and less noise pollution. Norwegian Airlines was recognised for successfully disrupting the well-established Latin American aviation scene by launching its low-cost service to Buenos Aires and for creating an internal flight network servicing 72 Latin American destinations, opening up the destination to European travellers. Audley Travel was awarded for going above and beyond to offer excellent training opportunities to its sales team with the aim of developing their product knowledge. For example, the company introduced an induction scheme during which staff are hosted in Latin America as a guest for one month. The programme has delivered impressive results with productivity up by 20%. Aqua Expeditions recognises that its employees are at the heart of the business and has developed a number of company schemes to ensure staff satisfaction. Some of the company’s initiatives include offering child benefits to all employees, and a ‘School for Parents’ scheme providing support to staff with young families. 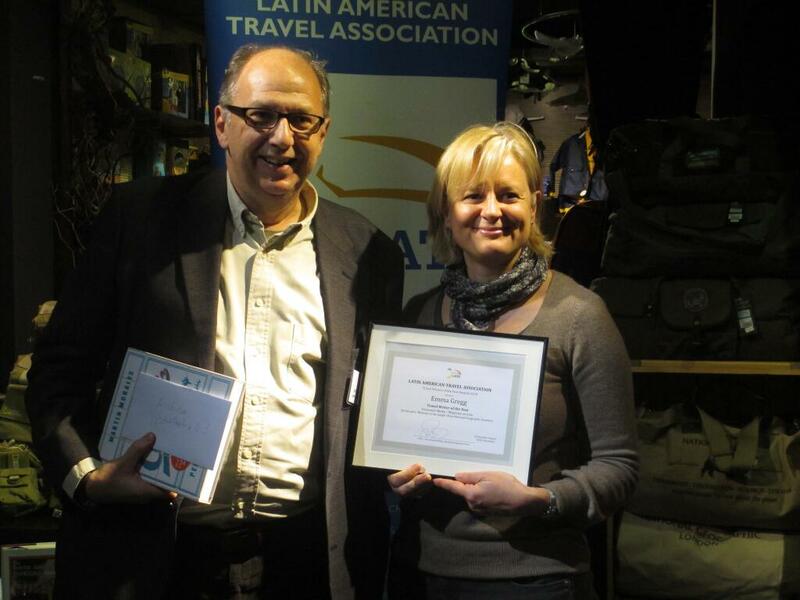 EcoCamp Patagonia was awarded for being one of the few operations permitted in the Torres del Paine National Park. The property is based on the design of indigenous houses in geodesic domes that blend in with the landscape. 90% of the power is provided from solar and hydroelectric sources. Luxury Hotel Hacienda AltaGracia was recognised as one of the leading properties in Latin America offering a completely authentic Costa Rican experience. Visitors can engage with local communities and learn about traditional customs by joining a variety of programmes at the hotel. Amazon Expedition Cruise Company, Amazon Nature Tours was awarded for its multi-faceted and strategic commitment to responsible tourism by ensuring operations have a minimal impact on the environment and for sharing the economic benefits of tourism with local communities. Condor Travel was recognised for its commitment to the environment and sustainable tourism highlighted by the creation of an NGO that manages the company’s social-environmental programme, and for its work with reforestation projects, and low-income families. Tierra Atacama was highly commended for being the first hotel in South America to be 100% solar-powered, and for its exceptional sustainability measures including a water system that has eliminated all plastic bottles from the property. Cox & Kings was awarded for its 2017 co-marketing campaign with PromPeru that highlighted Peru’s central tourism attractions and resulted in a 150% uplift in unique page views on Cox & King’s Peru page on their website and a 30% increase in bookings made to the destination. Journey Latin America was recognised for its 2017 ‘TV and Cinema’ multi-platform campaign. The campaign showcased key aspects of Latin America, whilst being successful in raising awareness of the JLA brand and strategically targeting a specific demographic. Peak DMC was awarded for demonstrating its commitment to high-quality and safe tours by ensuring all staff receive real-life scenario training with paramedic instructors. Cascada Expeditions was recognised for its efforts to offer guests a fully immersive Latin American experience by continuously seeking new programmes and developing new tours in lesser-known countries. Vapues Tours was highly commended for its environmental and sustainable tourism efforts such as working with university students to teach them about the importance of the environment. Latin Routes was awarded for its diverse growth strategy, resulting in a turnover growth of over 150% in the last three years, as well as its commitment to pushing sales through travel agents. Cox & Kings was recognised for its dedication to increasing tourism to Latin America from the UK, and for piloting travel to the region through joint marketing work with tourist boards, one of which resulted in a 30% increase in bookings to Peru. The archaeologist and curator of the Americas at the British Museum, Dr Jago Cooper, has been honoured with the LATA media award for 2015 for his September 2014 BBC series Lost Kingdoms of Central American. 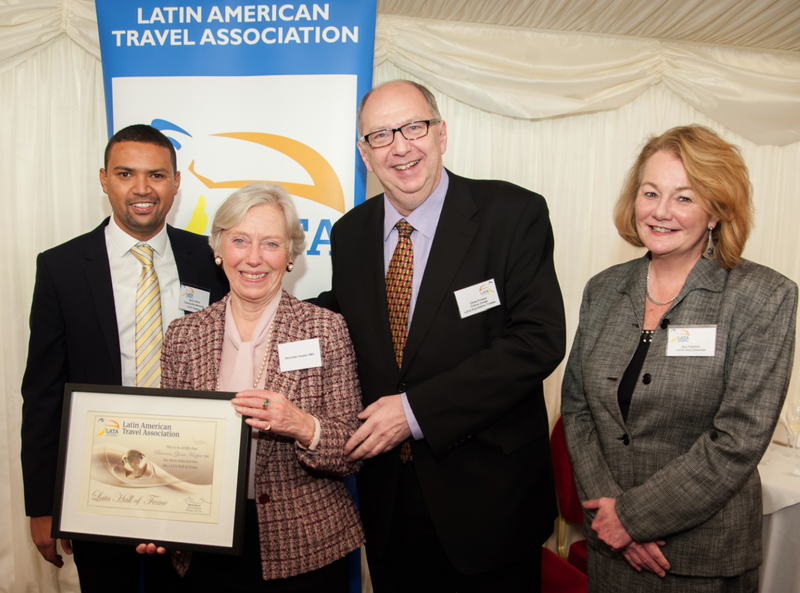 The presentation took place on Wednesday, 4 February during the All-Party Parliamentary British-Latin American Group and Latin American Travel Association’s tenth annual reception ceremony, which was held in the Palace of Westminster and hosted by The Baroness Hooper CMG and LATA chairman Byron Shirto. Dr Cooper follows in the footsteps of the supermodel Lily Cole, who received the award in 2014 for her film about and her work in the Amazon rainforest, in 2013 it was Michael Palin and in 2012 Jonathan Dimbleby. Baroness Hooper, House of Lords life peer and president of the Anglo Latin- American Foundation, was also inducted into the LATA Hall of Fame, an honour bestowed on outstanding individuals and in recognition of the vital contribution she has made in the development of LATA and realtions with Latin America over the years. The Baroness Hooper is inducted into the LATA Hall of Fame (LtoR) LATA chair, Byron Shirto; Baroness Hooper; LATA Foundation Trustee, Chris Pickard; and LATA Vice Chair, Sue Faithfull. The Rt Hon Hugo Swire MP, Minister of State for the Foreign and Commonwealth office, a role that includes responsibility for Latin America, delivered the keynote speech, while Critical Divide’s Christopher Pickard spoke on behalf of the LATA Foundation, for which he is a trustee. 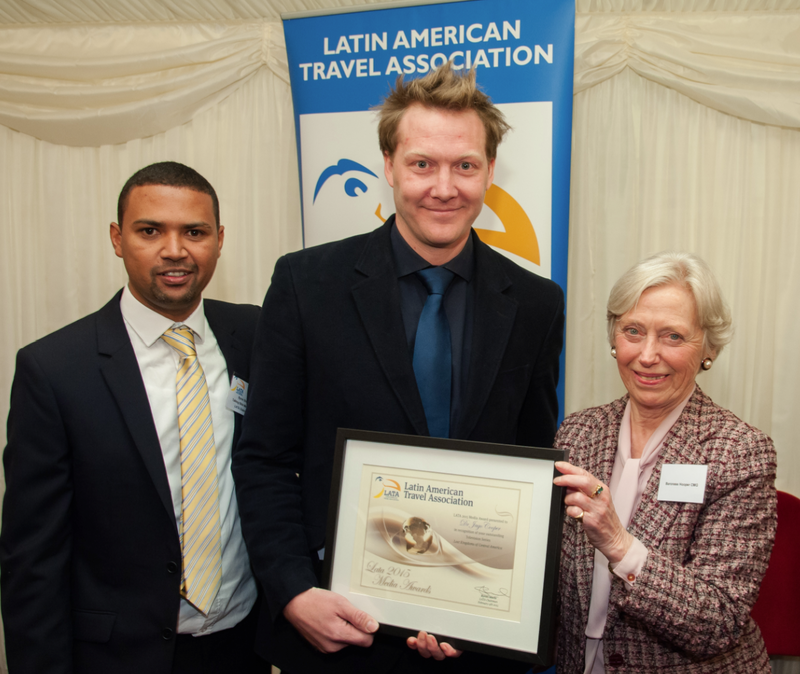 The Latin American Travel Association (LATA) has announced the winners of its 2014 Media Awards, held at the National Geographic Store in Knightsbridge, London on 12 May 2014. The winners were those who, in the opinion of the LATA judges, had written the most inspiring travel articles on one of the Latin American countries represented by the organisation. 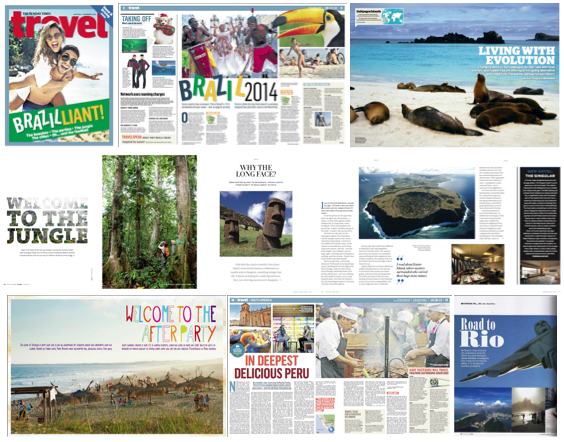 Sunday Times travel journalist Chris Haslam took top prize in the consumer newspaper category with his Brazil feature entitled ‘Brazilliant’, published in the Sunday Times on 6 December 2013; a round up of the country’s many attractions linking in with the forthcoming World Cup being held in Brazil. Wendy Gommersall’s Mail on Sunday feature ‘Mexican Wave’ was highly commended and Vincent Crump’s Peruvian foodie piece ‘In Deepest Delicious Peru’ for the Sunday Times received a special mention. Emma Gregg took the award in the consumer magazine category for her Peru feature ‘Welcome to the Jungle’ published in National Geographic Traveller; highly commended certificates were awarded to Nick Boulos for his piece on the Galapogos for Wanderlust; Laura Fowler’s ‘Where to Stay on Brazil’s Coolest Coast’ piece on Bahia for Conde Nast Traveller and Peter Browne’s ‘Welcome to the Party’ feature on Uruguay also published in Conde Nast Traveller. The award for the best travel trade press feature went to Joanna Booth for her ‘Why The Long Face?’ piece on Easter Island, published in Travel Weekly’s guide for agents selling luxury products ‘Aspire’. Lauren Holmes writing about Rio ‘Beach and Beyond’ for TTG Luxury was highly commended and Jenny Southan was given a special mention for her piece on Rio, published in Business Traveller that successfully crossed between the B2B and consumer readership. LATA Chairman and Critical Divide Director Chris Pickard said: “The standard of entries this year was higher than ever, which made the judging process very difficult. The LATA membership really appreciates the continued enthusiasm and interest from the media for all things Latin America and there is certainly no shortage of editorial coverage. Some of our members are very niche with small marketing budgets so the coverage is especially valuable and helpful to draw attention to the many and diverse attractions of Latin America. The LATA Travel Writers of the Year Awards were judged by members of the LATA committee. Winners were presented with a variety of prizes including restaurant vouchers for Martin Morales’ Peruvian kitchen, Andina, and from Las Iguanas, wines from Garzon of Uruguay and copies of the first 1924 edition of the South American Handbook. Earlier this year, LATA honoured the actress, super model and environmentalist, Lily Cole, with the LATA Media Award for 2014. Ms Cole had visited the Amazon in Brazil where she directed her own short film “Wild Rubber” She is also an ambassador for Sky Rainforest Rescue and the WWF (World Wildlife Fund), who between them are committed to saving a billion trees in the Amazon through green economics. 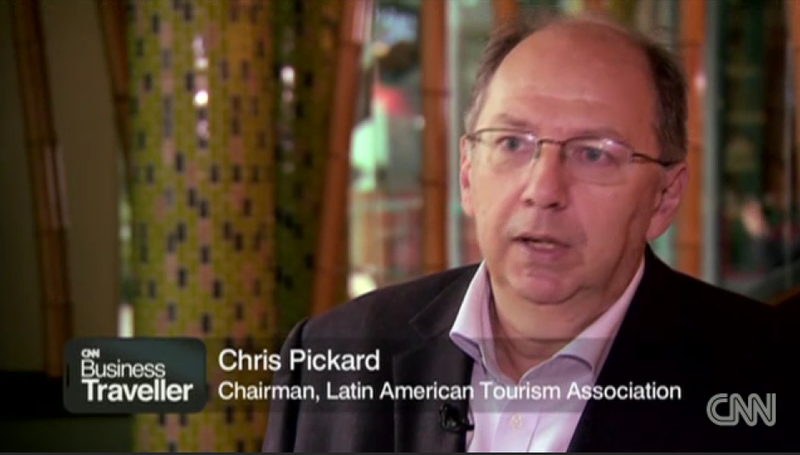 Critical Divide’s Chris Pickard is stepping down as the chairman of the Latin American Travel Association (LATA) and from the association’s executive committee, a body on which he has served for 14 years, nine as deputy chairman and two as chairman. He will step down after the new LATA Executive Committee – which will be elected at the association’s AGM on 19 May – meet and choose the new chairman and officers. Pickard, who lived and worked in Brazil for 20 years, steps down at a time when LATA is registering record membership levels and revenues, and on the eve of Experience Latin America, a major new b2b show that is being launched by LATA on 16 June. 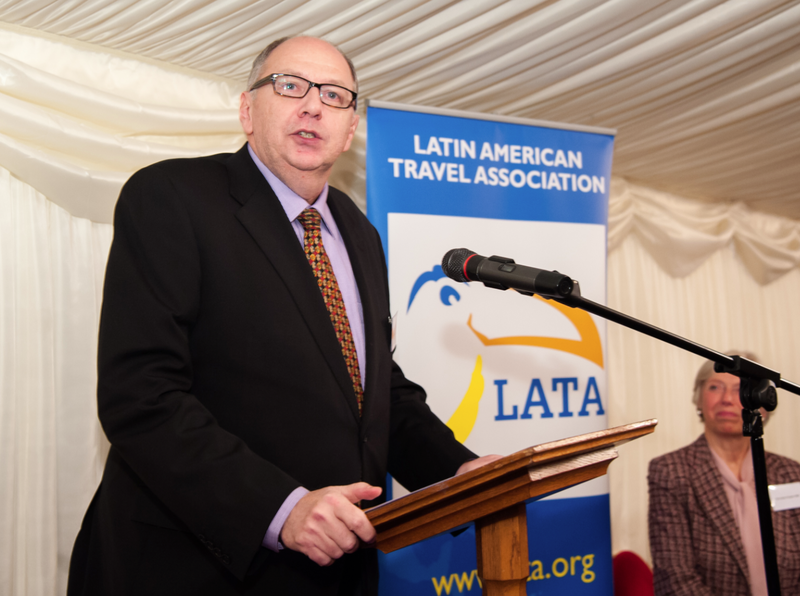 With LATA, its membership and finances in rude health, Pickard says he has no doubts that the new chair and executive committee will be able to continue the work of modernising and expanding the association and says that Experience Latin America will take LATA to a new level within the industry as the association will effectively control the major European based Latin American focused travel trade event. Pickard said he felt he could step down now because LATA is in such good shape, and because he accepted that he needed to commit more time to other projects that were not LATA related. A film he developed and co-produced, “Rio 50 Degrees”, directed by Julien Temple, will air shortly on the BBC, while his web sites braziltheguide.com and worldcuptheguide.com have proved very popular with travellers heading to Brazil for the upcoming World Cup. Pickard says he makes no claim to any legacy at LATA, although he did expand the executive committee and encourage the Latin American and overseas members to have a greater voice within LATA. 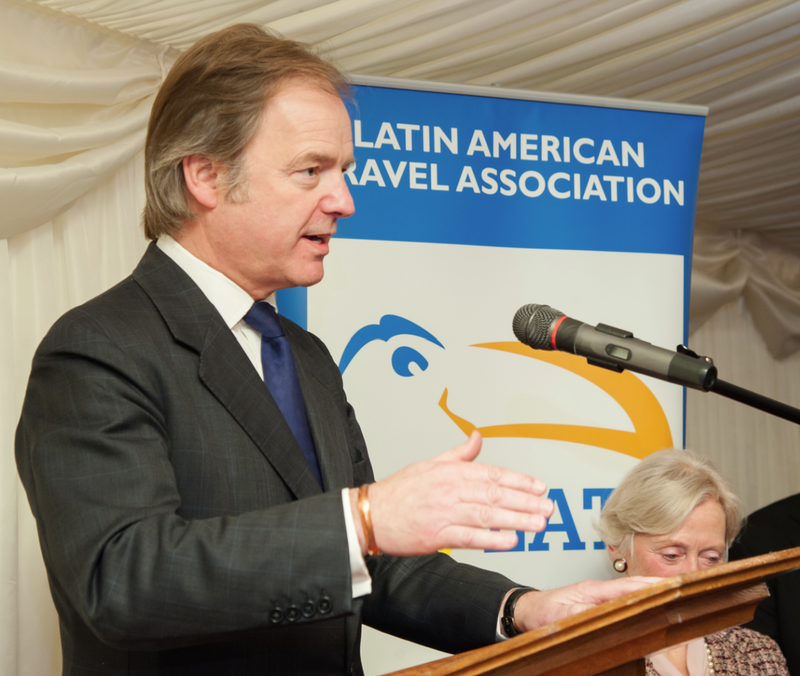 He also helped establish the annual LATA reception with the All Party Parliamentary British-Latin American Group as a key date in London’s Latin American calendar. In recent years the event – which is held in the Palace of Westminster and attended by most of the Latin American ambassadors in London – has seen LATA’s annual Media Award presented to Michael Palin, Lily Cole and Jonathan Dimbleby. Experience Latin America by LATA, the new b2b trade show bringing together key suppliers from Latin America with buyers from the UK and Europe, is on track for launch in less than eight weeks time. 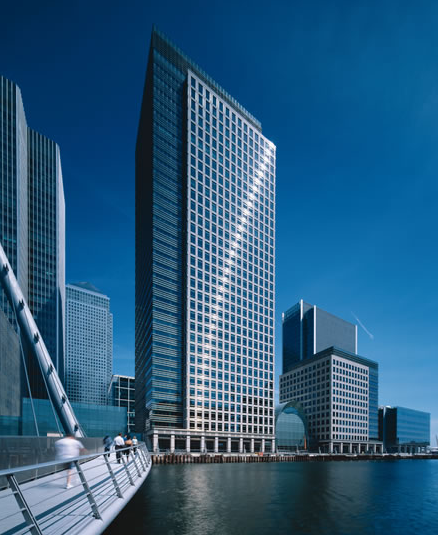 So far the event, which is being held between 16–18 June, at 40 Bank Street, in London’s Canary Wharf has attracted around 100 confirmed exhibitors from a cross section of suppliers operating in the region. LATA has also announced details of the seminar programme with two categories – ‘Uncover’ or ‘Discover’ seminars. Exhibitors including tourist boards such as Brazil, Argentina, Chile, Costa Rica, Peru, Quito and the CTO; leading airlines serving the region such as AirEuropa, Avianca, British Airways, Caribbean, Copa, Iberia, LAN, TAM, TAP and United; hotel companies including Alvear, Belmond, Fasano Hotels, Grace Hotels and Inkaterra, are among those exhibiting and even leading cruise lines, such as Silversea, have recognised the promotional and business opportunities the event brings. With delegates by invitation only and registration growing daily, the three-day show will bring together carefully-selected companies wishing to increase business to Latin America, including Brazil. Pre-scheduled meetings, inspiring seminars and plenty of networking opportunities should ensure a cross-section of Latin American suppliers and overseas buyers and media get ample opportunity to meet and network, learn about new products and strengthen existing relationships. LATA chairman and Critical Divide director Chris Pickard said: “We are delighted by the response we have had for the first year from both the suppliers and the buyers – a true reflection of the interest from the UK and Europe in Latin America as a destination and the belief of the Latin American suppliers in the future growth of the UK outbound market. The seminar programme is a fundamental part of the experience for buyer and supplier delegates to engage, interact and learn at Experience Latin America. The ‘Discover’ and ‘Uncover’ seminars will provide education, inspiration and interaction for all delegates attending the event. ‘Discover’ seminars will be destination themed offering delegates the chance to learn about each region and specific product highlighting the incredible variety of experiences in Latin America. Trends in cruising in Latin America. The Experience Latin America social programme will kick off with an official launch party on 16th June sponsored by Air Europa. 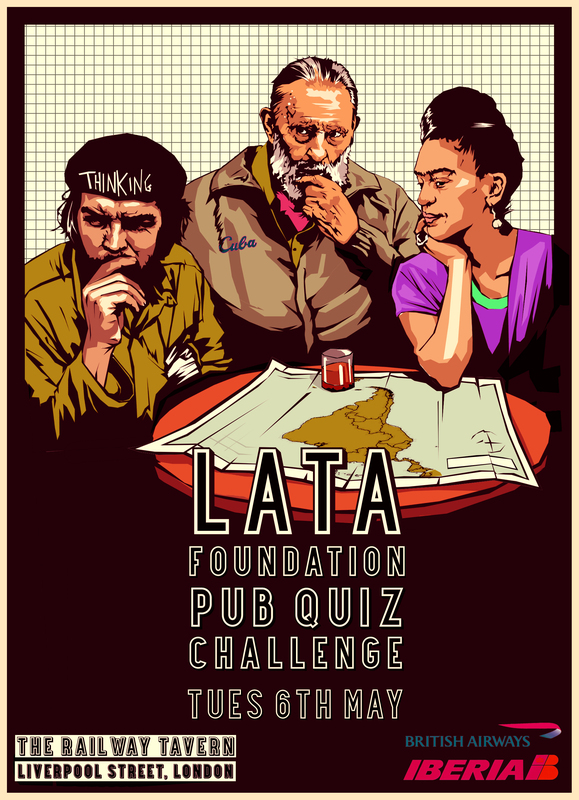 The annual LATA Foundation Pub Quiz, hosted by British Airways/Iberia, will take place on Tuesday, 6 May at the Railway Tavern close to Liverpool Street Station. Tickets in support of the LATA Foundation cost £15 per person. For more information, or to register your team, contact rsvp@latafoundation.org.